Our spacious Master Bedroom has a King Size Bed dressed to impress. 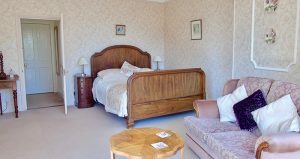 The room has a sofa in the triple aspect bay window with views onto the stunning gardens, a large en suite shower room and small dressing room. 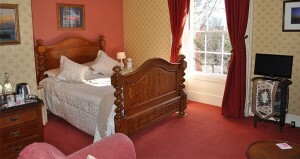 Our large Double Bedroom, with en suite shower room, is decorated in sumptuous red and gold, with a stunning, comfortable wooden bed. The window overlooks the formal front garden. 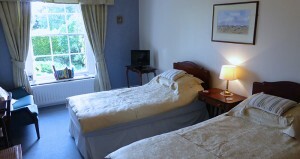 Our pretty Twin Room can also become a Super King Room and has views over the front formal garden and rockery. This room has a vanity unit plus a spacious, private luxury bathroom with a large bath and separate shower.